This post has been updated to include comment from Duke Energy. 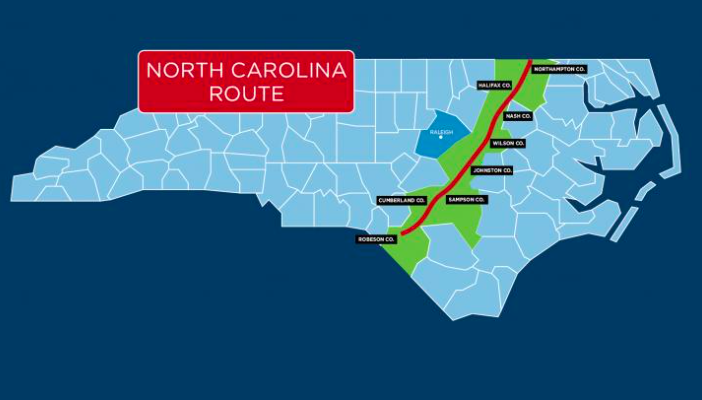 Anxious to begin cutting trees and clearing land to build the North Carolina portion of the Atlantic Coast Pipeline, Duke Energy has approached Gov. Roy Cooper’s office about the status of its permits, Policy Watch has confirmed. However, the utility did not use litigation as a cudgel to expedite the permitting process, as has been rumored, according to Ken Eudy, senior advisor to Gov. Cooper. Duke Energy, along with Dominion Energy, are the principals in ACP, LLC, which owns the 600-mile Atlantic Coast Pipeline. The route starts in West Virginia, where tree-cutting has already occurred, and continues through Virginia before entering North Carolina in Northampton County. From there, the natural gas pipeline continues 160 miles through seven more counties: Halifax,, Nash, Wilson, Johnston, Cumberland, Sampson and Robeson. Environmentally sensitive areas, including major rivers and wetlands, lie along the route. The pipeline also presents environmental justice issues. It would travel through many low-income areas and communities of color, including American Indian. ACP, LLC contends the pipeline is necessary to meet the energy demands of eastern North Carolina and to spur economic development. However, those forecasts are speculative. Most of the natural gas will go directly to Duke’s own power plants. Dominion has hinted that the pipeline would not stop in North Carolina, as originally planned, but move through South Carolina toward the coast. From there, the gas could be shipped elsewhere. Since last fall, the NC Department of Environmental Quality has asked for more detail at least 10 times in permit applications filed by the utility. Now with a February deadline looming, the agency is running out of time. Jamie Kritzer, DEQ communications director, said the permit is “under review.” He said he didn’t know of any legal overtures from ACP, nor did he have a timeline of when to expect an announcement about the 401 permit. On Jan. 4, DEQ disapproved ACP’s erosion and sedimentation application for the northern portion of the route, but the utilities can submit a revised plan. Permit applications for air, stormwater and 401 water quality are in some stage of review. But the 401 permit is the linchpin; if DEQ approves that application, then the agency will likely approve the others. Regardless of DEQ’s decision, lawsuits are likely. If DEQ denies the permit, then Atlantic Coast Pipeline, LLC, could sue, alleging the permit was improperly denied for reasons beyond the scope of the Clean Water Act. If the agency approves the permit, then environmental groups and property owners could go to court. Many property owners along the route have complained both at public forums and privately that they have felt strong-armed by the company hired to negotiate a price for their land. If these landowners can prove they were coerced or were low-balled on the fair market value of their property, they could also have a case. West Virginia and Virginia have already approved key permits. ACP, LLC has begun cutting trees for a portion of its Virginia route. According to the ACP website, trees are scheduled to be cut down along parts of the Northampton County route, beginning in March.